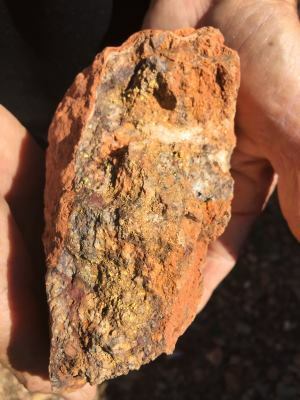 Where can I find Gold in WA? What sort of Geology and rocks should I be looking for that indicate gold could be present? Where am I allowed to go Metal Detecting in WA? What are The best metal detectors and Equipment to use to get ALL the gold. How do I set up and use GEOMAP on my computer with free Geological and TOPO Maps to easily research prospective Gold Locations? How do I set up GEOMAP with a computer and GPS so I know EXACTLY where I am, anytime, in relation to Tenements and prospective gold locations. .... and be using GEOMAP immediately, after the seminar. Here the dates for 2017 for our Seminars. Some positions in the seminars have already been taken because people booked from last year and we have people from overseas and the Eastern States who have planned a holiday around specific dates. This is a link to the page relating to Gold prospecting lessons and seminars . This page has been updated to reflect the 2017 vacancies. It is very important that you read the terms and conditions document relating to the training for your own safety and peace of mind. You Select your preferred date. We Confirm it is available or offer alternative options. When the date is agreed a deposit invoice is sent to you. More information about the courses, such as Maps, Places to Detect, Section 40E Permits are sent to you about 5 weeks before the course. The (In House part) Training is held at the air-conditioned St John Ambulance Centre just behind the Caravan Park in Cue. If you are interested please complete the form on the webpage Gold prospecting lessons and seminars . This page has been updated to reflect the 2017 vacancies. Please remember that the course dates and numbers are limited and very popular so if you are interested don’t hesitate to book now. We book on a first come first served basis, and we do not overbook. We will offer alternative dates if they are available. Here is a few comments we have had from our emails in 2016. Thankyou for the course, organising a 40E and to Udo for inviting us to his house on Saturday nite. Found some gold at (location removed) one piece was 6.6grams which I enjoyed digging out of the calcrete. My apologies for not making the last day, had nothing to do with any negative views on the seminar ,was a credit to all your crew with a very well presented presentation ,so very helpful with Geomap & all the other info, so accept my heartfelt thanks for a great seminar. At the moment up at Meekatharra, picked up some nice pieces the last couple of days. I would like to thank you, Sue, Udo and Kurk, I had a really good time and learnt a lot. As far as I am concerned there was nothing to improve on. I found a few pieces of gold around 3g which was a bonus, I thought we had found a good patch but it turned out to be pyrite (boo hoo). I am sure we will catchup again on one of the APLA events and if I find anything in the meantime I will let you know. Just wanted to say thanks again for your great course. 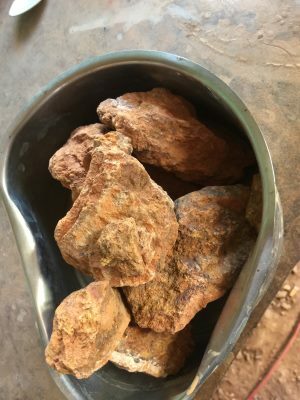 It was very informative and has made it even more enjoyable to be out bush looking for gold knowing exactly where you are and where you are allowed to be without having to look over your shoulder. Joe, Mat and myself found gold every day and this would not have been possible without Geomap and the training. This was highlighted by people at the caravan park who left their holiday early as they were convinced there was no gold left. Thank you very much for the training seminar. I know we are a bit late in providing feedback, but having spent a few weeks further north in Exmouth (fishing), we returned back to the goldfields. Thanks to your training we have managed to pick a 10 small pieces ranging from 0.3 up to 2.5 grams between us. The seminar itself was perfect, with a lot of information to learn within the first 2 days, and the materials providing an excellent resource material for follow up. It easy to see how much effort you guys have put into the training, and your passion shows through. Geomap is a fantastic tool and we are using this quite often, not only for tenement locations but also for the geological map info. We’ve managed to apply for a Section 40 in Menzies area for our trip back to Victoria. The group was enjoyable and we great time, even though the temperature was right up there. Just a quick email to say thank you for all your time and effort in putting together such a good seminar. We had a little knowledge (always dangerous) but now feel comfortable in the knowledge we can prospect legally. 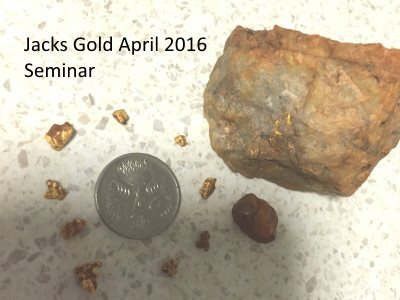 Jacks gold found at seminar practical day April 2016. 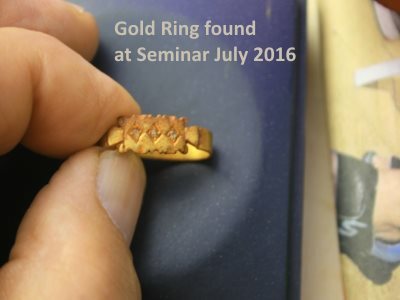 Gold Ring found at seminar practical day July 2016. Now moving on we want to share with you what we have found since completing your course in Cue in May 2015. We now have just over 5 ounces!!! The biggest piece being 13 grams. Coil used was the nugget finder 12 x 7 - an excellent coil. Thank you all for providing such a great, useful and helpful course. We've learnt so much. Particularly useful was Geomap and Tengraph online. john and I would like to take this opportunity to thank you for sharing your knowledge at the seminar. We found it to be of huge benefit to us both in the weeks since with our prospecting. 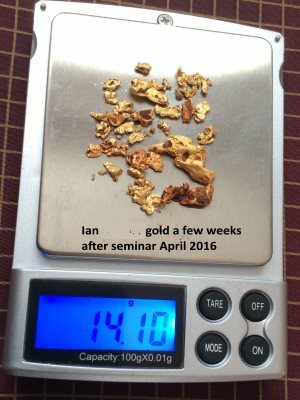 We found almost 8 ounces of gold for the season, 6 of which we have found since the seminar. We have worked only on pending, vacant and leases that we had written permission from the leaseholders to go on and have used Geomaps on a daily basis. We will also be using Geomap over the off season to plan our next prospecting trip. Max’s specis that yielded 6 ounces of gold Cue WA This is the gold specimens (rock) that was found after a seminar in Cue by Max. An example of one of the specimens An example of one of the gold specimens that was found after a seminar in Cue by Max. 6 ounces gold after dollying and melting down. 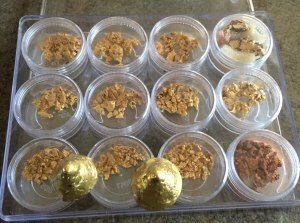 Melted gold and gold nuggets found after a seminar in Cue by Max. 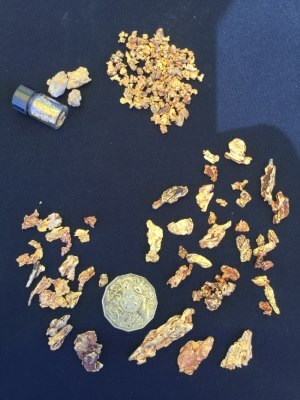 This is some of the gold we got on our trip to WA the 4kg rock with a lot of gold showing the end result was a 6 0z of gold sitting on the scales. Thanks to Bill and Udo for their training courses give me the knowledge to help me find gold. 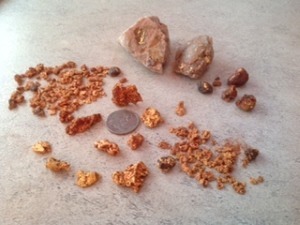 Total gold found was 12 ounces. Nobody gets ALL the gold. There’s still plenty left for you. p.s. If you are at all interested please contact us quickly as these seminars will book out within a few days.